Prior to joining ZwillGen, Devron worked at Facebook, where he worked with the public policy team on issues related to election integrity, data privacy education, and augmented and virtual reality. Prior, Devron summered at PwC in its Technology, Media, and Telecommunications group (TMT), where he focused IRS reporting requirements for casino jackpots and researched and wrote thought-leadership pieces on autonomous vehicles, rural broadband, and Puerto Rican privacy laws. Before that, Devron spent a semester with the Network Advertising Initiative (NAI), where he examined the GDPR’s effects on the third-party online behavioral advertising eco-system. 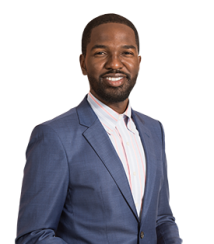 Further, Devron spent a summer in-house, as a Legal Counsel on Legal Diversity Fellow (LCLD) at Fannie Mae, where he assisted attorneys with Fair Credit Reporting Act (FCRA) class actions. Lastly, before law school, Devron served as a Special Assistant in the United States Senate. Devron graduated from The George Washington University Law School. As a student, he was the Senior Publications Editor for the Federal Communications Law Journal (FCLJ), a member of the Moot Court Board, and student in the Small Business and Community Economic Development Clinic.